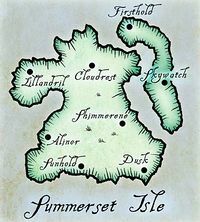 Sollicich-on-Ker was a serfdom located in the province of the Summerset Isles, halfway across from the city-state of Alinor on the region of the Summerset Isle. Sollicich-on-Ker was primarily an estate owned by a minor nobleman, Lord Gyrnasse, who owned various serfs. Among these servants was Trechtus, who is more commonly known as Vanus Galerion. Lord Grynasse was active during the early Second Era. He was very strict and forbid his serfs from learning, claiming that literate serfs were an abomination and a danger to everyone around them. When the smugglers that brought Trechtus books were found, they were promptly executed and Trechtus' father was kept hanging for weeks amidst the hot summers of Sollicich-on-Ker. Three months later, Trechtus escaped Lord Gyrnasse's Keep and made it to Alinor, which was on the other side of the island. It was there that he met Heliand, who eventually took him to the island of Artaeum and the Psijic Order.